Commercial vehicle solution provider, AXN Heavy Duty, has announced the launch of its new Electronic Motorized Landing Gear – The eLEG! AXN’s eLEG takes the work out of raising and lowering Landing Gear by the traditional crank method. A simple push of the button raises and lowers the Gear. 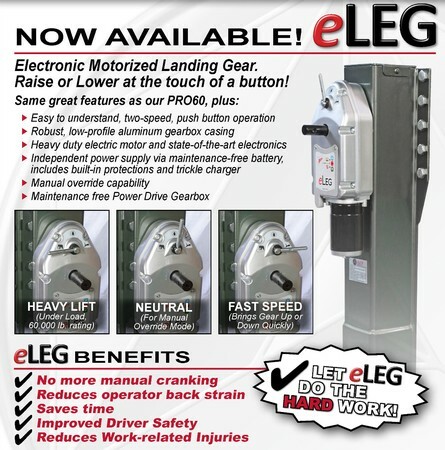 Manual override capability Some of the benefits of eLEG include reduced back strain, improved driver safety, time savings and reduced work-related injuries. The eLEG is available to order now in sets. For more information on the eLEG from AXN Heavy Duty, please visit the company website at www.axnheavyduty.com or drop an email to info@axnheavyduty.com.